If you follow my blog you know I am always hunting for new podcasts on retro gaming to help occupy my days. After you have listened to, and are fully caught up on all your favorites, you end up have a lot of time to fill. So I end up hunting again. too, and I was in the mood to play F-Zero on the SNES, but it was 10AM on a weekday and I was at my desk working. So I decided to put F-Zero in as a search topic in iTunes hoping to find an SNES podcast, or hear a podcast about F-Zero’s development. My search bought back a few results some of which I already knew about, and some others that where irrelevant, but I did find this one that sounded really interesting. 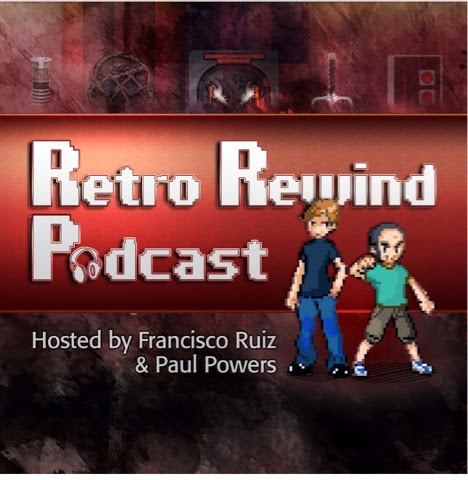 The podcast was named the Retro Rewind Podcast and as I looked into what the podcast was about I found that it was something that I might actually like to listen to. So I decided to give the podcast a try with the F-Zero episode, and very quickly found that I liked the podcast, its format, and it hosts. Now, I have to warn you that the podcast doesn’t only cover retro games, they also talk about movies as well. So if you’re looking for a pure gaming podcast you may not be into this one, but if you like getting a little nostalgic over games and movies from the 80’s and 90’s I think you’re going to really like this one. with that said they keep the podcast on a low key that is funny and engaging, and makes you feel like your having a conversation with friends. I love this format for nostalgic topics, because it allows you form your own memories and thoughts on a subject during the podcast, making you feel more like a participant in a conversation than a listener. Other podcasts on similar subjects with blaring background music and interruptions could take a lesson from the guys at the Retro Rewind Podcast as to how a nostalgia based podcast should sound. Another thing I like about this podcast is that each episode focuses on one topic. So you aren’t hit hard with nostalgia on a bunch of things, but rather you get a really well thought out show that concentrates on one subject from beginning to end, which as previously stated it allows you form your own memories and thoughts on the movie or game they may be talking about. They usually end the show by rating the movie or game: Classic or Tragic (2nd Class in older episodes), and in newer episodes the middle rating nostalgic. I have found that when it comes down to doing these ratings the host and guest hosts usually put a lot of thought into it, coming up with some pretty strong arguments as to whether or not they believe the movie or game stands up over time or is just kind of a relic of its era. Its actually a really fun and thought provoking rating system. Overall, it has become a fast favorite of mine, and if you like movies and games from an era most Gen X-r’s remember fondly, this may be one you want to look into. Retro Rewind Podcast, or on their website retrorewindpodcast.com, where you can also find some of their older podcasts.